Obaby’s irresistibly cute B is for Bear bedding selection is the perfect addition to any tot’s first nursery, with an adorable design which can surround your little one with sweet dreams and enjoyment throughout their earliest years. 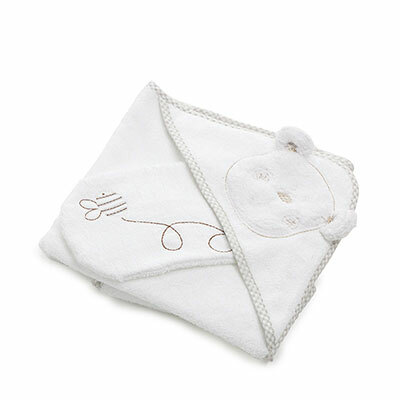 This fuzzy and lovable hooded towel set thoughtfully features a delightful and soft B is for Bear design, complete with a perfectly placed pair of ears, ideal for turning your tot into Obaby’s most beloved bear. As well as providing a stylish and snug environment for drying your little one, there is also a super sweet wash mitt for wiping away bubbles during bathtime, so trips to the tub can be fun-filled for both parent and child. Available in a range of colours, this beautiful hooded towel set looks fantastic alongside Obaby’s B is for Bear furniture, while also having the ability to look great within a wide variety of other nursery settings and styles.